Solar Energy | Metro Services Inc.
Metro Services, Inc. is committed to environmental responsibility and the reduction of our world’s dependency on fossil fuels. Our solar systems are integrated into roofing systems as investments that add value to a house or business. Canopies, skylights, trellises and carports help to beautify the look of solar panels and help with your power bill. Photovoltaic Solar Panels will be the best investment on your structure, by far! With the tax rebates and incentives offered today, solar panels are economical and efficient for your home or business. You simply cannot lose with Solar Panels installed by Metro Solar. You could save hundreds from switching to solar energy! Try our solar savings calculator to see the incentives and tax rebates your expected to receive in your state. We have been in business for over 20 years with an exceptional reputation. Our customers include commercial and residential buildings located throughout the country. Ever wonder how the sunlight converts into energy — or how some houses and business actually sell their energy back to the power company? If you are generating more power than you are using, then your local power facility will often buy the power from you. Light from the sun consists of particles called photons. As photons are absorbed by the solar panels the photoelectric effect causes the flow of free electrons — electricity! This meter measures the instantaneous solar current output from the solar panel. You can watch the current increase and decrease as clouds pass overhead. This is the device where direct current (DC) from the solar panels is transformed into 240 volt alternating current (AC) at 50 Hertz, suitable for running household appliances. The kilo-Watt-hour (kWh) meter is a cumulative measurement of solar electricity which shows the total amount of electricity produced by the solar panel in kWh units. The main switchboard is the common link in the whole grid interactive solar system. When the solar panels are generating more electricity than the needed load, the excess power is exported to the electricity grid. The grid supplies electricity to the switchboard on a cloudy day or during the evening when the solar panels are not generating electricity. 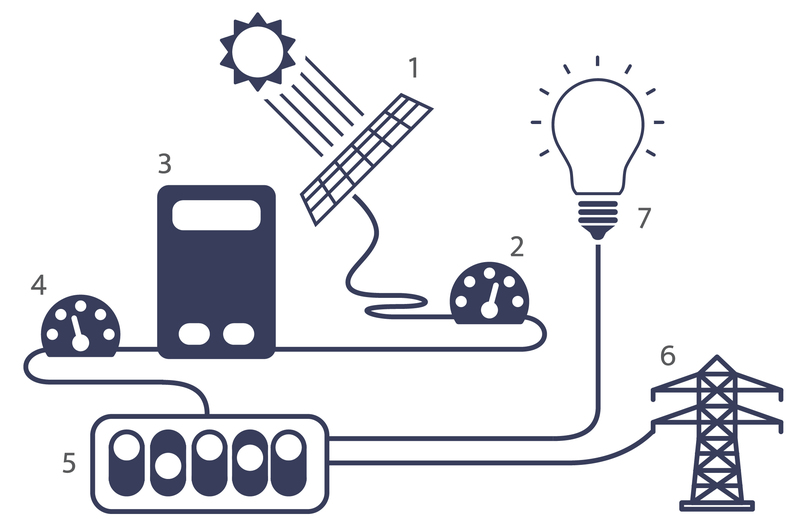 Additionally, the grid supplies electricity to the main switchboard when consumption of electricity is greater than the amount of electricity the solar panels are producing. The load is the electricity that appliances such as lights, computers, and refrigerators are consuming. Electricity is supplied to the appliances via the switchboard.